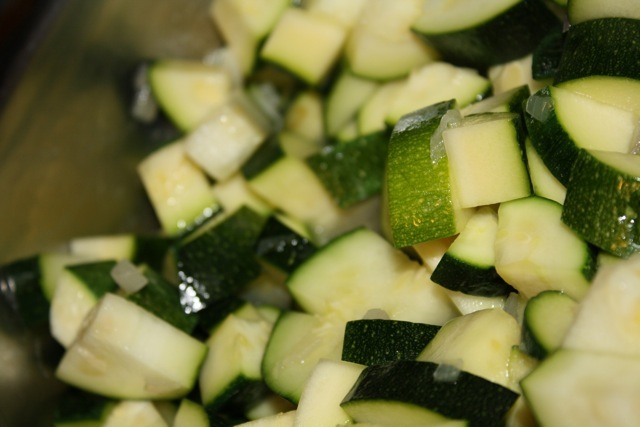 When we went to Georgia for my Grandma’s birthday, we received an abundance of zucchini my parents grew in their bountiful garden. Not totally sure what to do with all of the zucchini, Jill and I started looking through cookbooks for inspiration. I came across a recipe for risotto. While I did not make the recipe I found, I did get inspired to make a risotto. 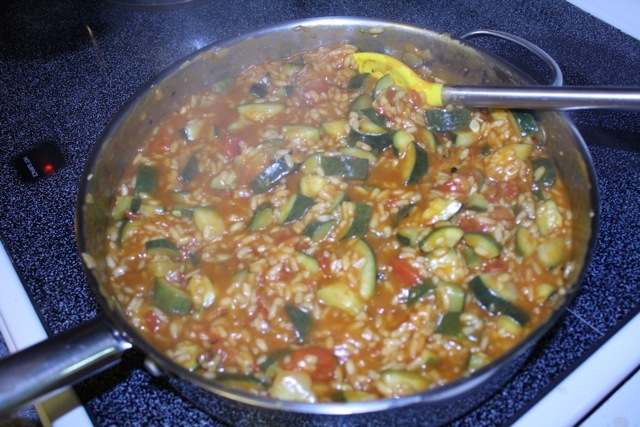 This is my blending of two classic foods: zucchini with tomatoes and risotto. 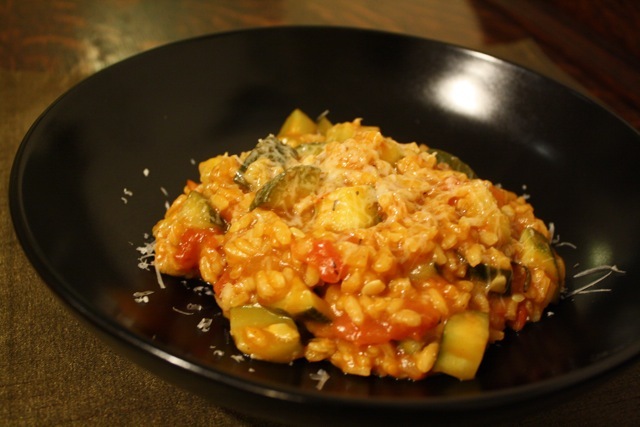 To create the liquid for the risotto, I poured the vegetable broth, tomato juice, and liquid from the can of diced tomatoes into a pot over medium heat. Before the liquid began boiling, I turned the heat down to low and let the liquid simmer. In a large skillet, I heated a nice glug of olive oil over medium heat. I didn’t measure the olive oil, but it was probably about 2 tablespoons. I sautéed the shallots until they were soft and add the zucchini and Chardonnay. I cook this for about 5 minutes, while stirring often. I then added the arborio rice and cook the mixture for another minute. 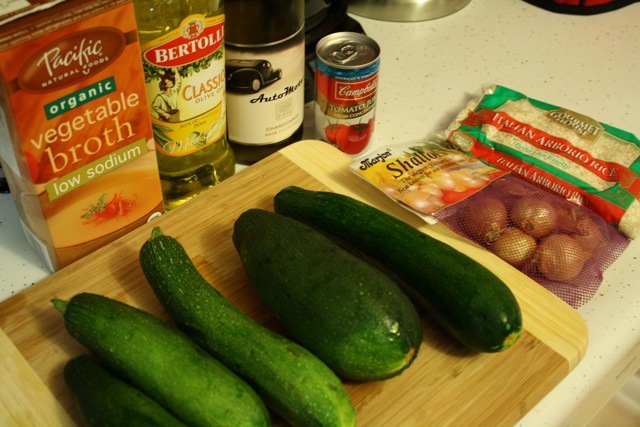 I added about a cup of the warm vegetable stock-tomato juice liquid to the zucchini, shallot, rice mixture and stirred until the liquid was absorbed. I then added about a half of a cup of the liquid and stirred until it was absorbed. I did this until all of the vegetable stock-tomato juice liquid was absorbed. I then added the diced tomatoes to the risotto and stirred for a few minutes. I turned the heat down to low and seasoned the risotto with salt and pepper. I then shredded parmesan cheese over the top of the risotto.